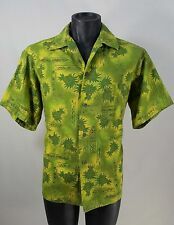 Multicolored HAWAIIAN LUCU Short Sleeve Buttondown Hawaiian Shirt L. Front Length: 28". Bust/Chest Across: 25". 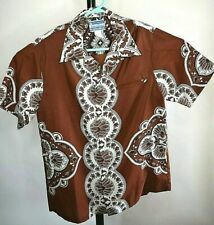 Design 1/2 Button Down Hawaiian Shirt - Made in Hawaii. Body Height 28". 29" from the base of the collar to the hem, 18" across the shoulders and 22" from armpit to armpit. Length (Collar seam to Hem on backside) 30 ". I do my best to show several photographs of the item, front and back, including any flaws. Sleeves 10". Just look at this killer vintage Hawaiian shirt!!! Best pattern ever, great condition!!! Highly reputable seller!!! Fast n’ free shipping!!! Size Extra Large (XL), Style 220. Made and Styled in Hawaii. Pre-owned, normal to average wear. Made By: Hawaiian Reserve. Material: 100% Rayon. Length: 29" (center rear collar to hem) 27" (shoulder to hem). Shoulders: 19". Up for bids is a RJC Hawaiian mens large shirt with surfboard palm trees and ski graphics. It is in great shape with no tears, rips, or stains. Let me know if you have any questions. Pomp & Circumstance print by Eugene Savage. Single welt chest pocket. Label: Waltah Clarkes. fabric covered buttons, loop collar, flat bottom. Made in Honolulu. No fiber content labels. Chest: 44". Made in Honolulu Hawaiian shirt. Beautiful polyester shirt with large collar button down. Armpit seam to armpit seam: 23". WE’RE HERE & EAGER TO SERVE! PEACE, LOVE AND GUMBO Y’ALL! WIDTH TAKEN AT TOP OF SHIRT FROM ARM SEAM ACROSS SHOULDERS FROM SEAM TO SEAM: 19 1/2. LENGTH IN FRONT FROM SHOULDER SEAM TO EDGE OF HEM: 26". I don’t think it’s even been worn. 💯polyester. Length::31”. 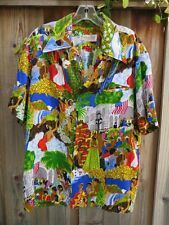 RARE 1970'S CLASSIC MULTICOLOR SILKY RAYON HAWAIIAN PRINT SHIRT SIZE MEDIUM. Shirt was made in Hawaii. This is a size exlarge. This does not have any flaws. It is not in new condition nor is it mint. Shoulder to Shoulder: 17". Chest (Pit to Pit): 19.5". Back Length from collar seam to hem: 27.5". Vintage 60’s Hawaiian Togs Barkcloth Bright Floral Hawaiian Camp Shirt XXL EUC! • In excellent preowned condition. No known flaws. This shirt is very rare and hard to find. Do not hesitate. I only have one of these. Material: Cotton blend, Acrylic?. Underarm To Hem 17-1/2" (Modern Large). Length: 29" (Bottom of collar and down). Armpit to Armpit: 21" Shoulder to Hem: 26.5". Very good condition; no flaws. Thick, textured cotton fabric, almost feels like bark cloth. Cabana Top. Tiki Hawaiian. Loop Collar. 25" from collar to hem. 18" across shoulders. We are not experts. Chest - 50". Item is in good condition. FOR LIBERTY HOUSE. See all 12 pics for details & enlarge each pic for a closer look. I am only guessing that this is a size large. If it’s not a large, I think it’s more on the side of XL than a M.
COLOR: multi color AND PIGS. LENGTH (BACK OF COLLAR TO BOTTOM): 26. T'S,POLOS, BUTTON UP SHIRTS, WINDRUNNERS/WINDBREAKERS CONDITION: NICE. If you are very particular, then used clothing may not be for you. Excellent, like-new, Condition. Adult sz Large. Armpit to armpit measures 22.5 inches. Top of shoulder to bottom of shirt measures 27 inches. Split sides at base. short sleeves. Estimated size is 2XL - Hibiscus buttons. Wooden Hibiscus Buttons. Pleated Back. Epaulet on shoulder. 4 Front pockets. Pointy collar with loop button. • 28” Long. • 25” pit to pit. Top button & loop. Length, from top of collar: 29. Shoulder to shoulder: 17. - embossed silver buttons. Chest, armpit to armpit: 21. Waist: 20. Tapa Print, Sea Turtles. Hawaiian Aloha Shirt. Royal Creations. Orchids, Ocean. Made in Hawaii. The colors are vibrant. with as new look. in Scranton, Pa. "THE LATE SHOW""I sold the best of forward Avant Garde fashion for guys and girls.This is ""MY PERSONAL SHIRT"". (195) so it just does not fit anymore. This is made in the USA. Hawaiian Togs. My guess is that it is no newer than the 1960s. SEE ALL pics for details & enlarge each pic for a closer look. Shoulder to end of sleeve is 9 1/8". MADE IN HAWAII. This is a great causal shirt, or a great dress shirt.